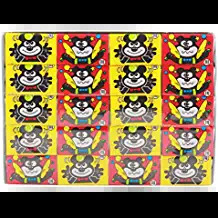 Buy Marukawa Fusen Chewing Bubble Gum Strawberry 60 Pcs offer on amazon. The deal price is Rs 399. Go Cashless: Get 10% cashback up to Rs. 50 using BHIM UPI (available only on mobile app/website) or RuPay cards. Offer period 1st September to 30th September. Cashback will be credited as Amazon Pay balance within 15 days from purchase.